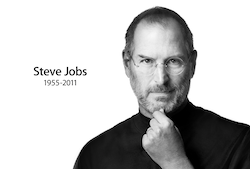 Steve Jobs, Apple's Ex-CEO and creative genius/visionary has passed away at the age of 56. He had been battling pancreatic cancer since August 2004 and only stepped down from the CEO role in late August 2011 due to his health. RIP Steve. I'll remember him for not only the great products his company released under his reign but also for his superbly delivered keynotes in his black turtle neck and jeans with no belt. I was lucky enough to see the main in action at WWDC 2010 when the iPhone 4 was launched. CNet writes "One of the most legendary businessmen in American history, Jobs turned three separate industries on their head in the 35 years he was involved in the technology industry."